The 2/3″ compact lenses are optically corrected and broadband coated for the spectral range of 400-1000nm(VIS+NIR) on megapixel cameras. They can image properly across the entire specified range without any focus shifts. The robust mechanical design with lockable focus and iris-setting mechanism guarantees long-term stability even in typical production environments. 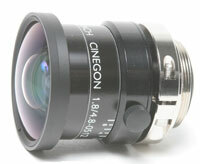 Most of the 2/3” format lenses accept an M30.5×0.5 filter thread, with the exception of the Cinegon 1.8/4.8mm lens which uses a filter adapter to accept an M62x0.75 filter. Compact Series lenses are also available for 16mm and 22mm sensors.